By now you should have read the betting basics, giving you an understanding of the way betting odds work, what types of bets can be placed and how they can be combined into multiples. You are now ready to place your first bet, this walkthrough will guide you through the typical process, ensuring you are happy and confident with what you are doing. For the purposes of this guide we will be using screenshots taken from Ladbrokes. If you are yet to sign up with Ladbrokes we recommend you take advantage of the current £50 free bet! 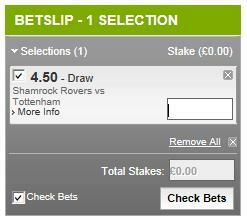 Typically you’ll find that the bookmakers websites have dedicated sections for each sport they cover. In the case of Ladbrokes, there are a couple of favourites available at the top left – by default these are Football and Horse Racing, although you can personalise this if you like. Below the favourites you’ll see a full A-Z of other sports. 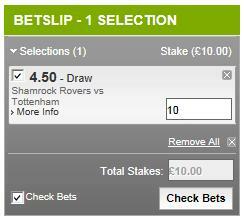 The top match is a Europa Cup match between Shamrock Rovers and Tottenham. 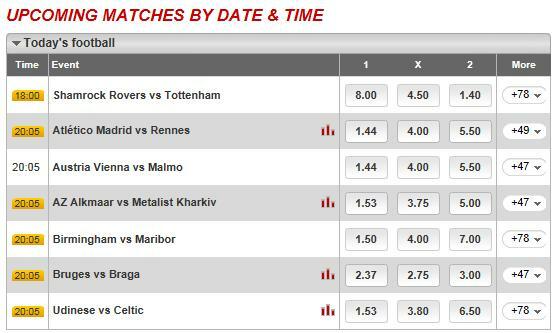 To the left you will see the start time of 18:00, to the right (underneath the columns “1” “X” “2”) are the match odds. This is typical bookmaking notation for a football match, with “1” representing the home team (Shamrock Rovers), “X” the draw, and “2” the away team (Tottenham). 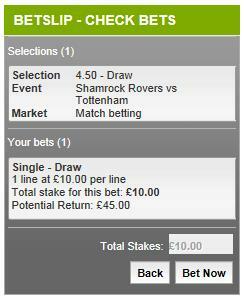 Once you’ve done this, you should check the top right of the betslip, where it confirms the value you have typed. 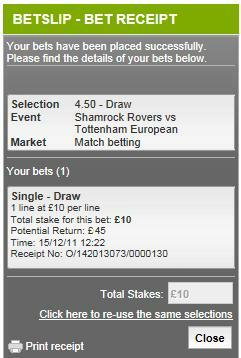 In our example, it shows “Stake (£10.00)” which is correct. That’s it! Pretty simple really, but hopefully this guide will assist you in making your first bet. If you require further assistance, please refer to the other betting guides in the Betting school. Finally, please remember that all the online bookmakers have extensive help and support sections, so you can always refer to this if you have any questions or problems. In addition to the written help, they also run “live help” sessions, where you can chat in real-time with an operator. They are always online and ready to help with whatever issues you might have to ensure your online betting is an enjoyable experience.